Tuscany is invariably the number one choice of buyers who consider entering the property in Italy market. However, its neighbour to the east, Umbria, is increasingly winning investors over as it has not suffered from Tuscany’s decades of inexorably rising prices. And in truth, from the moment one steps foot in Umbria, appeal of owning property in Umbria becomes eminently clear. Its centuries of rich history seem to emanate from every cobbled step and church facade in its scenic hilltowns and villages, which are within easy enough reach of one another to be comfortably visited in one fell swoop, even on a relatively brief trip to this part of Italy. In addition it is not overrun by the millions of tourists who flock to Tuscany and consequently is all the more delightful for it. Umbria proudly describes itself as The Green Heart of Italy, and with good reason. Landlocked it may be, but some of Italy’s most stunning landscape is to be found here. Its has 750,000 acres of verdant woodland that includes seven nature reserves. So it comes as little surprise that Umbria is arguably the second most popular region, behind Tuscany, among investors in property in Italy – a trend accelerated when Perugia’s airport was extended in 2006 to take international flights. 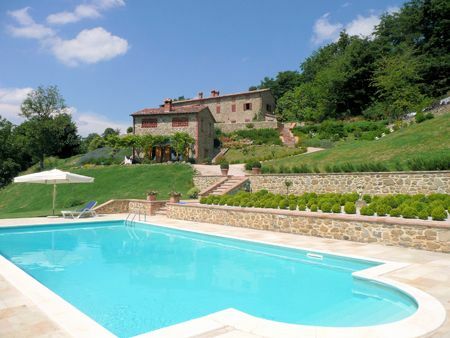 In truth, properties in large swathes of Umbria have soared to close to Tuscan levels. Expect to pay about €400,000 for a restored farmhouse in Umbria and around €250,000 for a two-bedroom apartment or house. If you are happy with a fixer-upper, a rustic property to restore can cost under €100,000. But bear in mind you may spend an additional €300,000 bringing it back to its former glory. However, these average prices do not portray the whole story and there are highly affordable properties available in Umbria if you look in the right places. For instance, on the northern shores of Lake Trasimeno, a one-bedroom property in Tuoro sul Trasimeno can go for just €100,000. Meanwhile, expect to pay €20,000 more for a new-build two-bedroom apartment and €220,000 for a new-build three-bedroom property. Bear in mind also that the current economic downturn gives buyers the whip hand and smart negotiators can frequently knock up to 10 or 15 per cent off the listed price of a property. Where in Umbria to buy? This is a region that has not lost its unspoilt charm, boasting a chain of splendid medieval towns apparently unaltered since the Middle Ages – Assisi, Perugia, Spello and Todi chief among them. However, the best thing for any prospective investor is to pay a visit to Umbria to get a feel for it in person. But deciding where to start can often prove a headache as the region boasts numerous attractions. One often preferred option is to base yourself in either Orvieto or Assisi and spend a handful of days, or a week if you have the time, seeing the lie of the land. Although Perugia is Umbria’s administrative capital, Assisi is its spiritual heart, the town where Italy’s patron saint St Francis set up his religious order in 1209. It now attracts pilgrims worldwide, chiefly for the basilica that bears the saint’s name and is his final resting place. However, if one town in Umbria matches Perugia for religious preeminence it is Orvieto, which looks down from massive cliffs and boasting an amazing cathedral. Other must-sees include Spello, an enchanting town on the slopes of Monte Subasio, Bevagna, which lies on ancient Roman ruins and wine-growing Montefalco, nicknamed “Umbria’s Balcony” for its magnificent views that go as far as Assisi and Spoleto.